I love curry and I have a staple diet of it on a regular basis. This one is really easy to make since I just use a can of this widely available green curry paste that I get from the Asian store. The only thing I did different this time is that I added some basil leaves in the mix to give it a more fresh and fragrant flavor. We don’t have any real Thai basil here in my neck of the woods so I just used the regular Italian variety, which is fine. Also, I seasoned with fish sauce for a more authentic taste. But it’s definitely fine to use salt & pepper, if you don’t have it. This is pure vegan recipe but you can certainly add some chicken, if you wish. I have in the past, I just didn’t have any at the moment. That’s why tofu became the star of the dish. Works for me! Oh yeah, green curry is way spicier than the red one, FYI. Okay, don the apron and get cooking! Heat oil in a pot and saute bell pepper, onions, eggplant and carrots in medium-high heat for a few minutes. Add in the garlic, dried basil and fish sauce and let cook for another couple of minutes while continuously stirring. Stir in the green curry paste, coconut milk and broth and bring to a boil. Once boiling, reduce heat to medium-low and let simmer covered for about 20 minutes. Give it a taste and re-season with more fish sauce if needed. 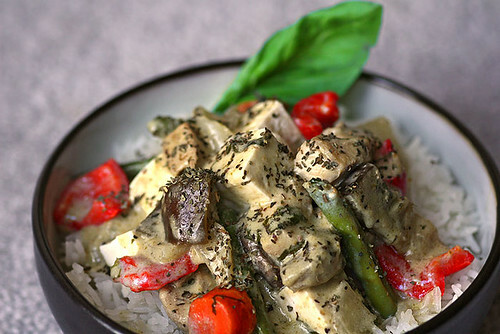 Fold in the tofu and fresh basil. Serve over a bowl of jasmine rice.